The dam film has massive sub titles. Can't be turned off. Breathtaking and will steal your heart! A breathtaking film, kept us totally captured. The characters are incredible, knew very little about Lady Gaga before watching the film but she is simply incredible in her acting debut. Bradley Cooper is incredible, his acting is breathtaking, his singing again is incredible and an amazing directing debut. A film that will take your breath away, I felt I lived every moment of the film with both of them and left me heartbroken and sobbing at the end. I've watched it twice in two days, downloaded the soundtrack and feel genuinely bereaved!!! How on earth can a film make you feel like that you ask?? Watch it for yourself. I'm a huge film buff and this is my absolute favourite movie of all time. Love the storyline and acting was good, however, spoilt for us by mumbling of some actors. The main reason for my luke warm rating is that a potentially brilliant film was spoilt by the constant use of the F word. It may be so commonplace now in society that it becomes almost acceptable but a good film shouldn't really need it in such vast amounts. A fabulous remake which engages the audience from start to finish. 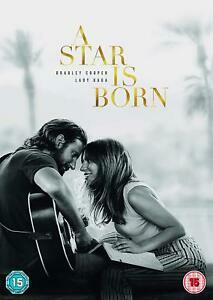 Fabulous remake of the story with portrayals of the two main characters Ally and Jackson by Lady Gaga and Bradley Cooper superbly crafted. The chapters engage you right from the start of the movie. Superb vocals by Lady Gaga. Be warned though: this story is a tear jerker if you are not familiar with the plot and bad language is a recurring theme which I felt detracted from this overall beautifully crafted production. The song “Shallow” was certainly worthy of an Oscar. Lads Gaga has an acting talent equal to her vocal/song writing skills. I watched this over a week ago and I'm still thinking about it.For me it was an emotional film. Bradley Cooper and Lady Gaga played excellent parts and I found it very moving. It's really a great film with the "best song" featured. Highly recommended.